Ready for October? 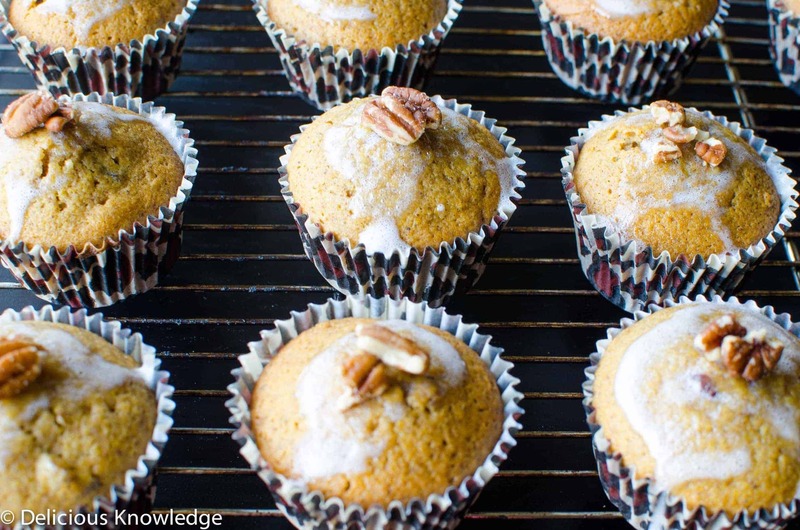 I’ve got you covered for pumpkin-covered everything season with these fall muffins. Amazing for brunch, thank-you gifts, Thanksgiving or Christmas, or just to eat on a chilly October morning. Which is exactly what how we had them. This weekend was relaxing and full of my favorite activity: quality time with BL. For the last two months either one or both of us has been traveling, making our together-all-the-time weekend that much more special. Seriously, is there anything better than morning runs, afternoon naps, and dinners out? I crave these days to reconnect and recharge. It’s not always easy, but it’s always worth it. I constantly have to remind myself that just because there are things that I could be doing, doesn’t mean I should. BL and I both said how needed this weekend was; an excuse to put away the business of life and just relax. So these muffins are my permission to you. Take a day off, relax and sleep in. Then rise to make these muffins! Enjoy them like we did, on a lazy Sunday morning breakfast, along with a huge, steaming mug of pumpkin coffee. Yes, it really is fall. Cheers to pumpkin season! Cranberry Pumpkin Muffins! Healthy, vegan muffins studded with walnuts and cranberries. Topped with a simple glaze. Preheat oven to 400 degrees F and line or grease a muffin tin. In a large bowl, mix together the all-purpose flour, whole wheat flour, sugar, baking soda, baking powder, nutmeg, cinnamon and salt in a large mixing bowl. In a separate bowl, whisk together the soy milk, vegetable oil, maple syrup and pumpkin puree. Add the wet ingredients into the dry ingredients and stir to combine into a batter. Fold in cranberries and pecans. Spoon the batter into lined tins about 2/3 full. Bake for 18-20 minutes until golden brown and a toothpick inserted in the center should come out clean. Remove from pan and let cool in cooling rack. Add 1 tbsp. of soy milk at a time until smooth and desired consistency. It should be a thick icing. 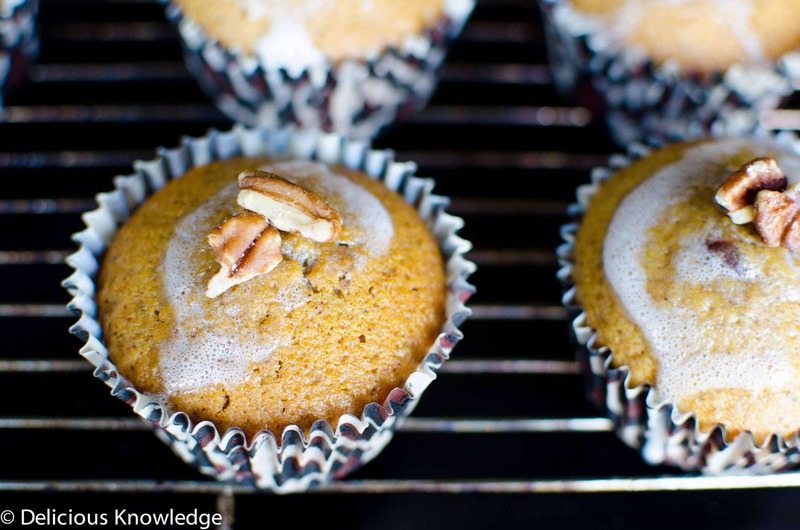 Add icing to warm muffins and top with pecan pieces. These sound perfect for those lazy weekend mornings you described. I love relaxing on the weekends with a long breakfast/brunch. It just makes me feel so refreshed and reminds me it’s good to slow down sometimes. Mouthwatering muffins…come to me! Love a bit of cranberries, pumpkins and the crunchiness from the pecans! 🙂 me too! I’ve made these a few times over the past few weeks, I just can’t get enough! Also makes a great bread if you don’t want muffins! Cranberries and pumpkins… these are two things that go hand in hand together! I have been really cooking/baking more pumpkins lately. I especially love roasting them. It makes the entire kitchen smell delicious and not to mention that its super high in vitamin A. If I am extra ambitious, I think I will try making my own pumpkin puree for this recipe. I might skip the glaze though, because I am trying to cut back on sugar. However, your glaze recipe is really tempting because using soy milk for the glaze does sound really interesting. I’ve never tried it. Do you think it would work with almond milk? Hi Elle, I think almond milk would be a find substitution for both the bread and the glaze!